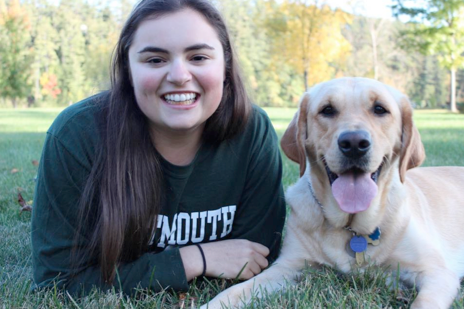 Dartmouth has a new and improved S and S on campus – Staci and Smidge! 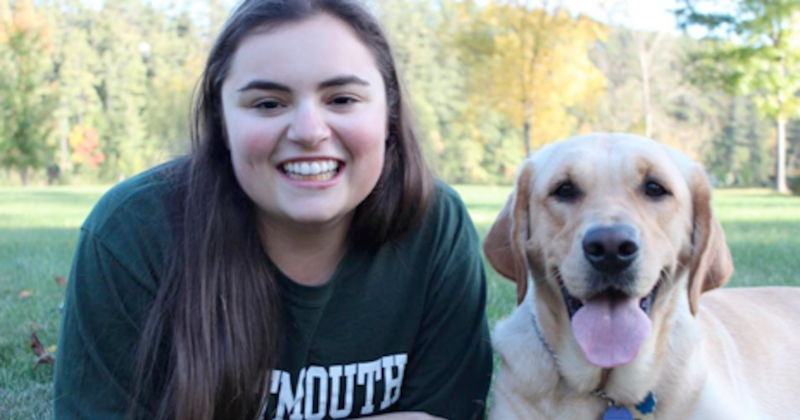 Staci Mannella is a Dartmouth ’18 from Randolph, New Jersey. She was born with Achromatopsia, a genetic eye condition that causes serious light sensitivity, poor visual acuity, and partial color blindness. It has not slowed her down in the slightest. 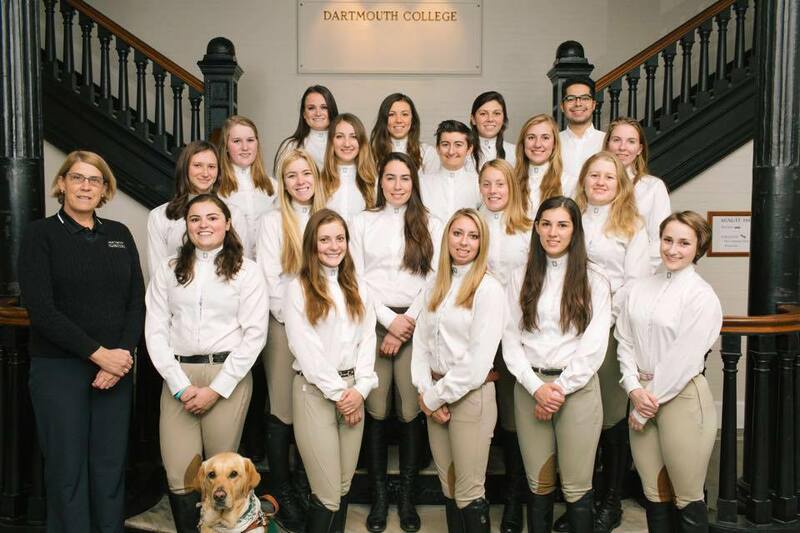 She’s not only on Dartmouth’s Varsity equestrian team, but is also a member of the US Paralympic Alpine National Team. 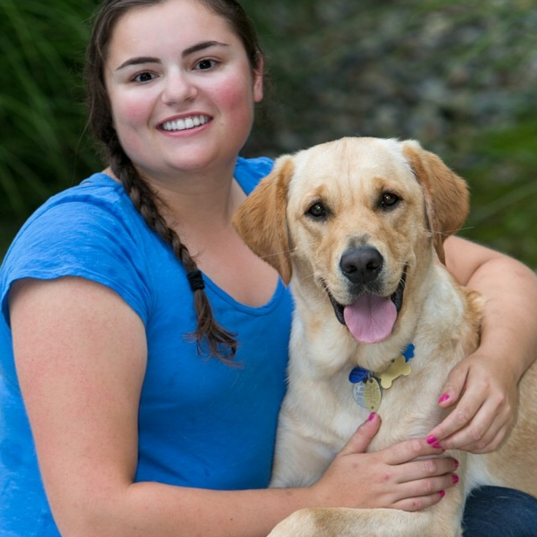 Her four-legged sidekick, Smidge, is a three-year-old Labrador retriever who serves as her guide dog. Staci and Smidge have both become campus celebrities. Staci, the Olympian known for her bright smile and radiating energy, takes Smidge to her every class and workout. We sat down with her to catch up on her skiing adventures and to talk about her unique and inspiring friendship with Smidge. 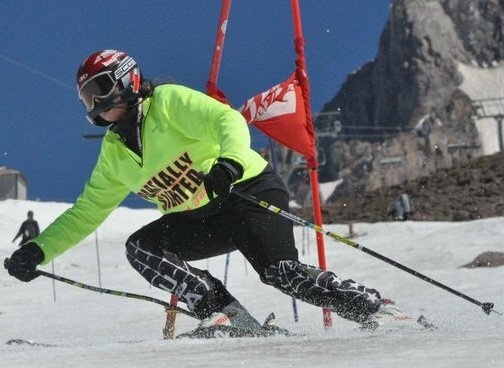 First things first: we hear you’re training with the US Paralympic Alpine Team overseas. Where are you right now and how has it been? I am actually at my house in Randolph, New Jersey. Today is my first night home since Christmas Eve. I flew home from training in Park City, Utah this morning and will be flying to Switzerland tomorrow for my first World Cup stops of the season. We will be skiing in Austria, Slovenia, Italy, and Switzerland. I took last year off from participating in the World Cup in order to complete a full year of school at Dartmouth so I have not been in a World Cup start in over a year. Is Smidge enjoying the adventure? While I am really excited for the trip, Smidge will unfortunately not be joining me. Traveling to Europe is a really long trip for dogs, and because I will be skiing most of the time, Smidge wouldn’t be able to get out much. She will get a little time off from work to just hang out and be a dog with my parents. She’s my mom’s favorite daughter, so she will probably be spoiled and untrained by the time I get home. I feel bad leaving her but I think it’s best for her to stay home on these longer trips. However, usually Smidge is great with traveling. I had her with me training in Utah and she was a superstar. We almost missed our connection in Chicago on our way home from Utah, and I had her running through the airport. She was so great weaving me in and out of people. She’s always really great in new places. I think she gets excited and pays better attention. I always feel like she gets bored of our routine at Dartmouth. How long have you known Smidge? I got matched with Smidge in May of 2014. Applying for a guide dog is a really long process. After a year of living with a volunteer puppy raiser, the dogs are matched and trained specifically to their new handler’s lifestyle. It takes almost two years for guide dogs to be fully trained and it is estimated that $50,000 is put into each dog by the time they are fully trained and matched to their handler. I went to school at the Guide Dog Foundation for the Blind for two weeks to train with Smidge to make sure I knew how to work with her. Were you two fast friends? To be blatantly honest, no. We weren’t best friends at first sight. 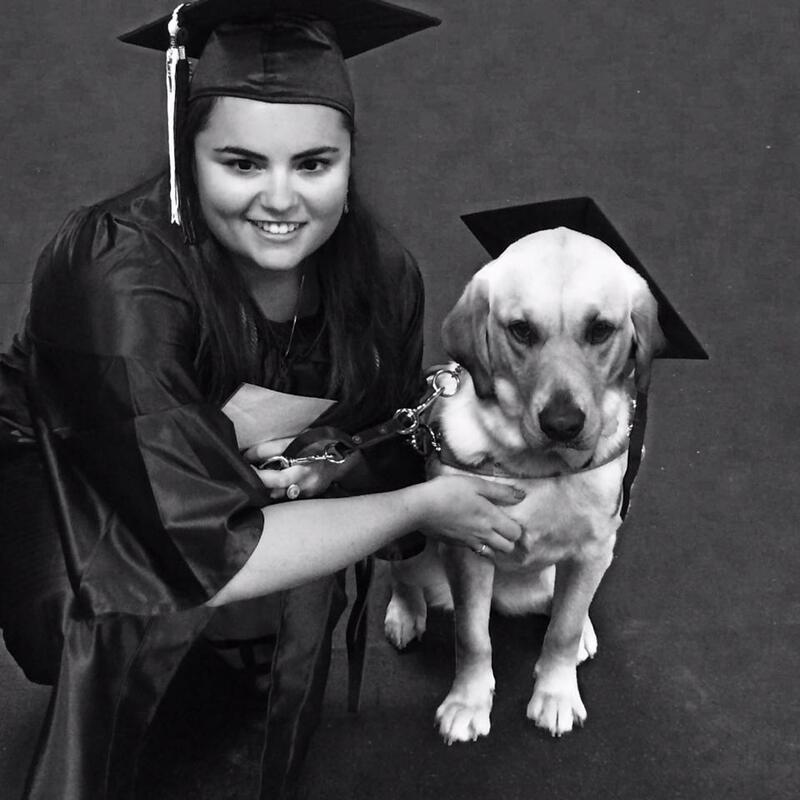 I applied to get a guide dog because I knew I would need to be independent after leaving home and going to college. I am not the average guide dog handler because I do have a lot of usable vision. For a really long time I felt like I didn’t need Smidge, that I was taking her from someone who needed her more than I. It took me a while to realize how much independence Smidge gives me. With Smidge I am confident and comfortable going by myself to do almost anything. That freedom is something I never knew before I was matched up with Smidge. 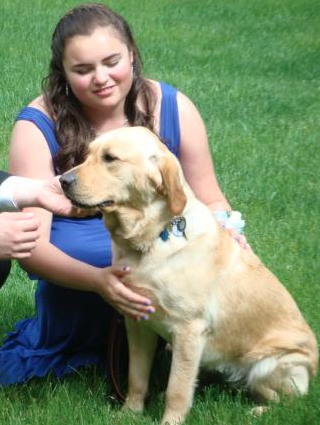 Even though Smidge and I weren’t best friends right from the start, we are absolutely best friends now. I could not imagine my life without her. 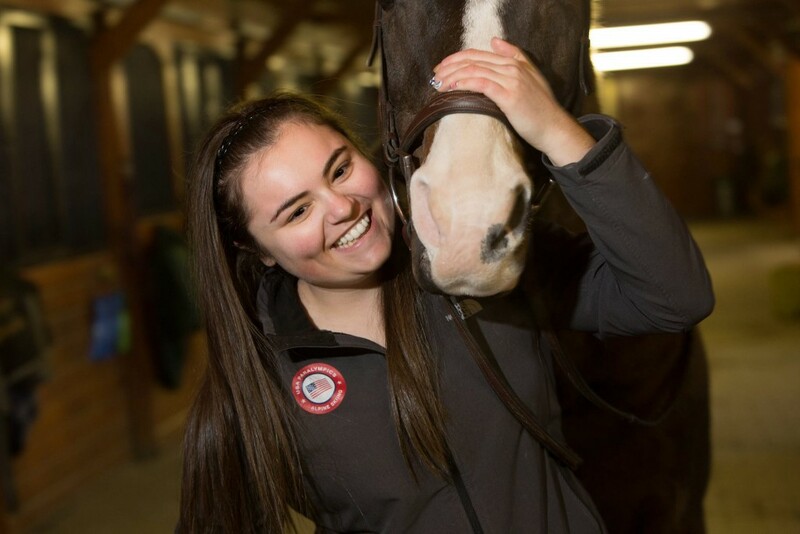 What was it like to represent the United States in the 2014 Sochi Paralympic Games? Participating in the Paralympic games was probably the most surreal experience of my life. I had been working towards the goal of making the Paralympic team since I was twelve years old. I had been working toward becoming a Paralympian for a third of my life when I finally made the Paralympic team at 17 years old. The Paralympics are kind of weird because athletes dedicate their lives to make the team for years, while the whole world watches for just a few seconds. Those few seconds during the games are not always the most accurate depiction of the dedication and struggle an athlete put in to get there. I learned a lot from my first Paralympic experience. Realizing that the work I put into become a world class Paralympian athlete was just as valuable, if not more valuable, was among the most important lessons I learned. No one really knows about the long hours I spent in the gym, the many papers I had to write on the road, or the small victories I had within myself during the process. Nevertheless, those were the most valuable memories. My first Paralympic experience has shaped my character. It taught me countless lessons that I will bring with me as I move forward with my goal of medaling at the 2018 Paralympics. 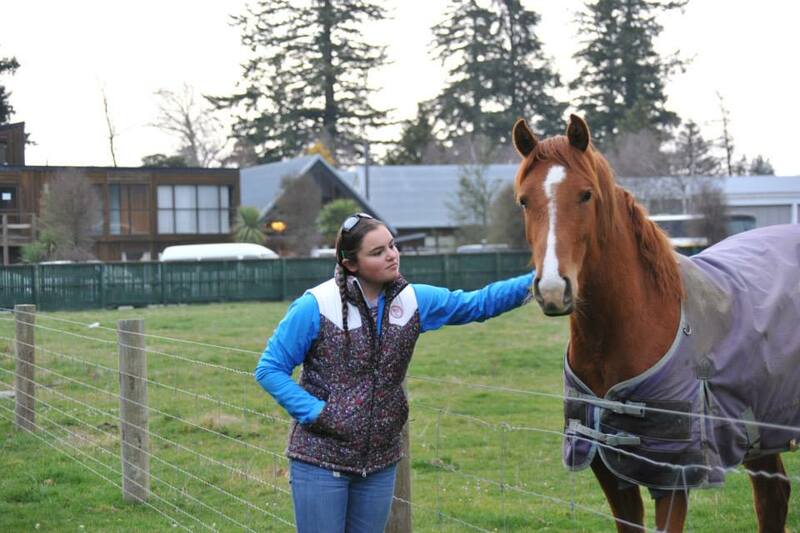 How did you get into skiing and equestrian? My parents wanted to find a sport my siblings and I could do as a family. When I was four years old I learned to ski at Windham Mountain in upstate New York. 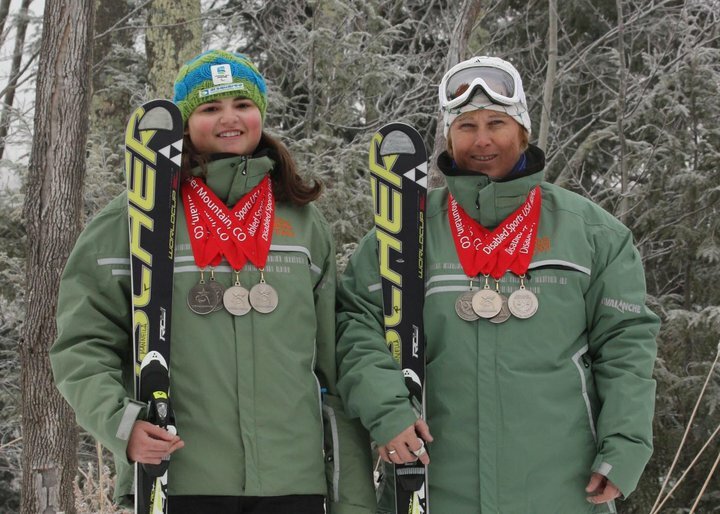 Windham has a wonderful adaptive ski program to teach children with disabilities how to ski. This is now my 15th season skiing! While my skiing career has brought me all over the world, I somehow always end up finding my way back home to Windham mountain. I started horseback riding at age 11, when I begged my mom to buy some raffle tickets at a fundraiser in order to win two free riding lessons. She often says it was the worst $20 she has ever spent because she has since spent thousands of dollars on the outrageously expensive sport. Horses are such a great escape from the rest of my life. I have so much freedom on the back of a horse. I cannot imagine my life without riding. I seriously can’t choose one. I love them both so much. I’m lucky to have the opportunity to be able to do both. Does Smidge get along well with your horses? Smidge gets a little nervous around the ponies. That is fine with me. I actually prefer dogs to be a little nervous rather than overconfident around horses. Horses are huge and often get nervous or do stupid, unpredictable things. I like that Smidge is a little cautious around horses because it keeps her safe. Is Smidge allowed to hit the slopes with you? No, Smidge doesn’t ski very much. She prefers hanging out in the lodge with a book and some hot chocolate. We do hike up the mountain sometimes though. What do you think makes you and Smidge such a great team? Smidge and I are a great team because we think a lot alike. Smidge is quick, brave, easygoing, motivated by food, and adorable. These are all qualities that we share. Smidge is a great dog. In her eyes, her soul purpose in life is to make sure that I am safe, and for that I am eternally grateful to have Smidge in my life. She is an extra pair of eyes when I fail to see parts of the world around me. She would do anything to keep me safe, whether that be stopping me from running into the construction outside Novak, finding the way out of Collis when it’s super busy, or watching through the office door to make sure I stay safe during my workouts in Floren. Even when she is off-harness and “not working” she is always trying to use her vision to make up for my lack of vision. Could you share a funny or heartwarming story/memory of you and Smidge? When I first moved to Dartmouth my parents stayed up for a few days to help me find my way around the campus. Smidge knew how to get me back to my dorm before my parents did. Once I was doing my laundry and I had Smidge off-leash, just hanging out. I started walking back upstairs to my room and she didn’t follow. I called her name and she came running. When I got back to my room she dropped a sock out of her mouth that I must have dropped in the laundry room. During General Chemistry my professor once forgot to tell me he was doing a demonstration that included an explosion. Smidge got so scared that she wouldn’t bring me back to Chemistry for weeks. I had to totally retrain her. I even started feeding her during class to try to get her to associate Burke with food. We worked it out but she is still really nervous in there. I couldn’t get her to stop hiding under the seats for the whole lecture. My roommate once had some people over so the door in the room was propped open. I went to take a shower, and when I walked in my roommate handed me my phone and asked me why someone from Oklahoma kept calling me. I answered the phone and the guy was like, “Uh, do you have a dog? I think I might have your dog.” Smidge had wandered all the way up to the fourth floor in the Fayes (I live on the ground floor) looking for me. Luckily we found her and I still love my roommate a lot. Final question. Rumor has it Smidge may receive an honorary diploma at Dartmouth for attending every lecture with you. That would be so amazing! Please tell us – is there any truth to this? As far as I am concerned, Smidge better get a diploma! She will have attended every class/lab with me by the time I graduate and could probably do better on my finals than I do. She deserves it! While I have not spoken to Hanlon or any administration about this matter, I do think we need to start working on this pressing issue now. If anyone has any connections or ideas about who I should talk to please let me know! So to any of our readers, please comment with any ideas on how to get Smidge her well-deserved Dartmouth degree! Perhaps someone could start a petition we could all sign and present to President Hanlon? In the meantime, we’ll all be wishing we could have a friendship as strong and as touching as Staci and Smidge. Check out Staci’s website, Facebook and Instagram.